You can tell QuickBooks to assess finance charges on overdue customer invoices. To do this, you first set up the finance charge calculation rules. After you’ve done this, you can easily assess finance charges on overdue amounts by choosing the QuickBooks command. To set up the finance charge rules, choose the Edit → Preferences command. When QuickBooks displays the Preferences dialog box, click the Finance Charge icon and then click the Company Preferences tab. The Preferences dialog box at this point should look like this. 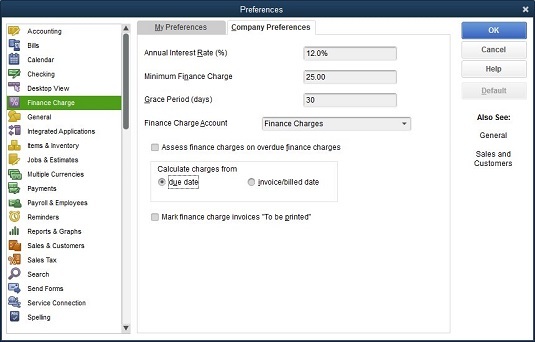 The Company Preferences tab of the Finance Charge section of the Preferences dialog box. To tell QuickBooks how it should calculate the finance charges, enter the annual interest rate that you’ll use for calculating charges in the Annual Interest Rate (%) box. Enter the minimum finance charge amount that you assess in the Minimum Finance Charge box. If you want to create a grace period, enter the number of grace-period days in the Grace Period (Days) box. Use the Finance Charge Account drop-down list to specify the QuickBooks income account to which finance charge revenue should be credited. Select the Assess Finance Charges on Overdue Finance Charges check box if you want to charge finance charges on finance charges. Finally, use the Calculate Charges From radio buttons — Due Date and Invoice/Billed Date — to specify the date from which finance charges should be calculated. After you’ve provided this information, you can click OK to save your finance charge calculation rules. QuickBooks assumes that you don’t want to print finance charge invoices. For this reason, the Mark Finance Charge Invoices “To Be Printed” check box isn’t selected. Finance charges typically appear only in customer statements. After you set up the finance charge rules, you can easily assess finance charges on overdue invoices. To do this, choose Customers → Assess Finance Charges. 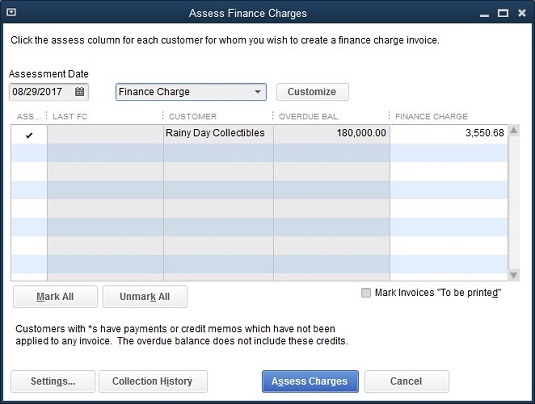 QuickBooks displays the Assess Finance Charges dialog box. This dialog box lists all the overdue invoices that customers owe you and, based on your finance charge calculation rules, calculates a finance charge. The Assess Finance Charges dialog box. To assess the finance charge to a particular customer, click the Assess field for the customer. (By default, QuickBooks assumes that you want to assess finance charges whenever a customer’s account is past due.) If you don’t want to assess finance charges to a particular customer, remove the check mark from the Assess field by clicking it. After you’ve identified which customers should be assessed finance charges, click the Assess Charges button. QuickBooks essentially creates a new invoice for each of these customers. These new invoices charge the customers a finance fee.